Floorwise are “Environmentally Innovative” and have a large selection of “green” & “recycled” products incorporating essential Green Star Policy materials. 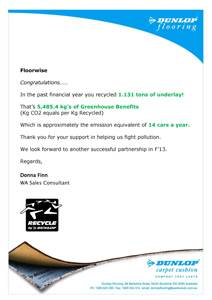 Floorwise has recycled 1.131 tons of underlay in the past financial year. That’s 5,485.4 kg’s of Greenhouse Benefits (Kg CO2 equals per Kg Recycled) which is approximately the emission equivalent of 14 cars a year. Click here to download the report.